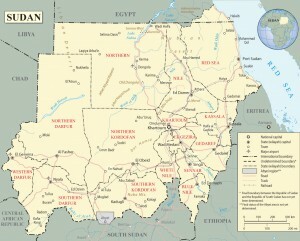 Sudan (officially the Republic of Sudan) (Arabic: ‎Al-Sedan) is a country in nor the astern Africa. It is the largest in the African continent and the Arab World, and tenth largest in the world by area. It is bordered by Egypt to the north, the Red Sea to the northeast, Eritrea and Ethiopia to the east, Kenya and Uganda to the southeast, Democratic Republic of the Congo and the Central African Republic to the southwest, Chad to the west and Libya to the northwest. Sudan (officially the Republic of Sudan) (Arabic: ‎al-Sūdān) is a country in northeastern Africa. It is the largest in the African continent and the Arab World, and tenth largest in the world by area. The country’s name derives from the Arabic Bilad-al-Sudan, literally “land of the blacks.” Sudan has recently emerged as the world’s most unstable country according to the 2007 Failed States Index, mainly due to its military dictatorship and the ongoing war in Darfur. The country has long been plagued by civil war stemming from political and economic inequality: most people in Sudan’s northern region, which includes the capital city of Khartoum, are Arab Muslims; while most southerners are non-Arab Black Africans who mainly practice traditional African religions or Christianity. Southern Sudan is widely acknowledged to have one of the worst health situations in the world. Despite its internal conflicts, Sudan has managed to achieve economic growth. d of the blacks.” Sudan has recently emerged as the world’s most unstable country according to the 2007 Failed States Index, mainly due to its military dictatorship and the ongoing war in Darfur.